Sun beating down on the tent. Birds singing. Daylight flooding in under the flysheet. Normally these are cues to get out of bed to start another day of cycling. But here, in the land of the midnight sun, it's often eleven at night or two in the morning when I wake up and look at the watch and the all-day daylight has me day-dreaming of the dark. There's been plenty of sunshine around since we cycled off the Hurtigruten ferry and cycled into another snowy white arctic landscape where we had one of our strangest camp spots. The land was covered with a metre of fresh snow and the only places cleared were the parking areas in front of holiday cabins. We put our tent up late one day in one of these parking places, thinking nobody would arrive but later a car pulled in and out stepped the owner of the cabin. Luckily he was quite happy for us to be there and wished us a nice evening. 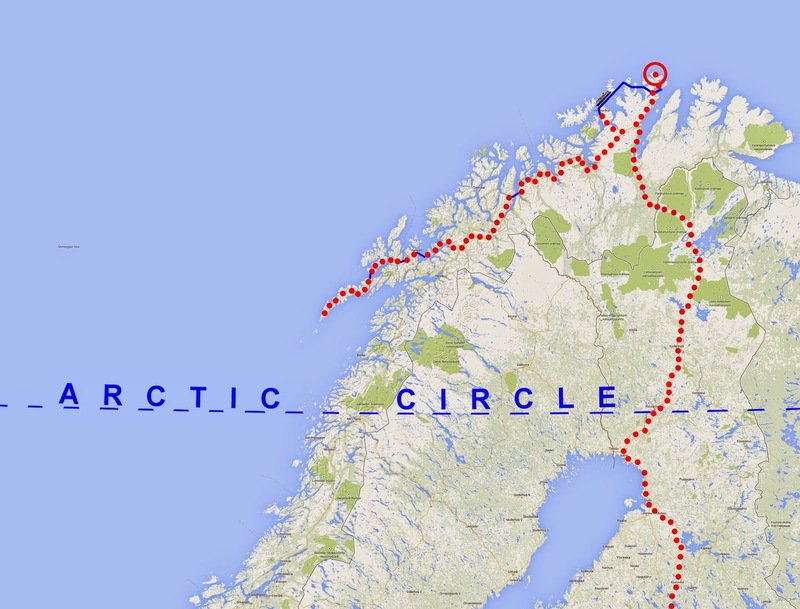 After that, we finally moved south and arrived on Norway's west coast. We're still above the Arctic Circle but here warmer ocean currents are allowing summer to begin to break through the ice. The frozen lakes are melting, the snow line is creeping upwards and the natural world is beginning to take advantage of the very short summer ahead. The people here are also preparing for summer as the small pastures of the little farms along the coast begin to turn green and come alive with lambs. Mind you, people are already preparing the wood for next winter. Views of snow capped mountains dominate and the sea is our constant companion as we pedal along the winding coastlines and islands. Sometimes it's on our left, next on our right and occasionally above us as we cycle through undersea tunnels. We often see dolphins in the water and sea eagles in the air space. The tunnels are hell for cyclists. Too narrow, too dark, too fume filled and even a small car coming up behind can sound like a freight train. A few days ago, we cycled onto another ferry that took us to a place l have always dreamed about visiting. Imagine islands where sheer snow-capped mountains rise from the sea, where idyllic brightly-painted fishing villages nestle around bays of aquamarine water and where Atlantic rollers break onto white sand beaches. 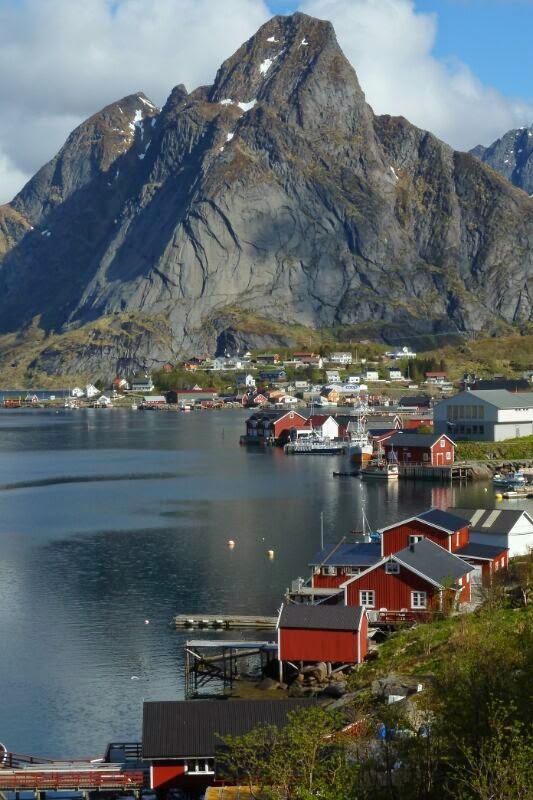 This is the Lofoten Islands, an unimaginably spectacular archipelago of dramatic rock that stretches west into the ocean off Norway's coast. 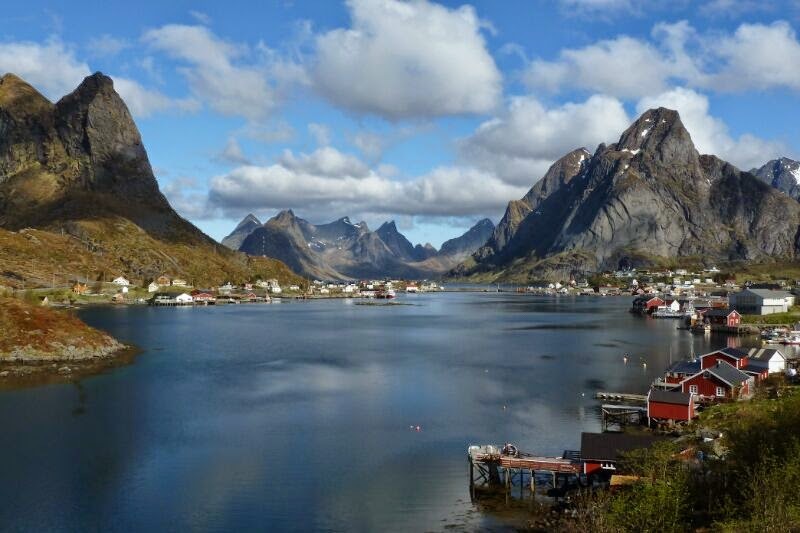 Small, quiet roads follow the coastline and fjords, and connect sleepy little hamlets. Fishing boats bob in the water and sea birds circle overhead. If it sounds too idyllic, you should also know that there is an ever-present stench of rotting fish as March to May is the fish drying season. Thousands upon thousands of cod are hung in wooden frames along the roads, in the villages and even right above people's front doors. 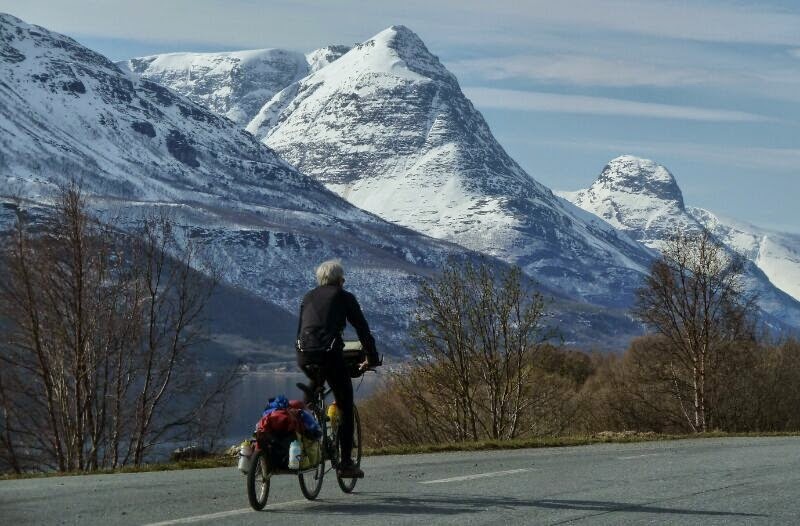 We'll continue to cycle south down Norway's west coast over the next couple of weeks looking for more beautiful scenery, great cycling and a good night's sleep under the midnight sun. 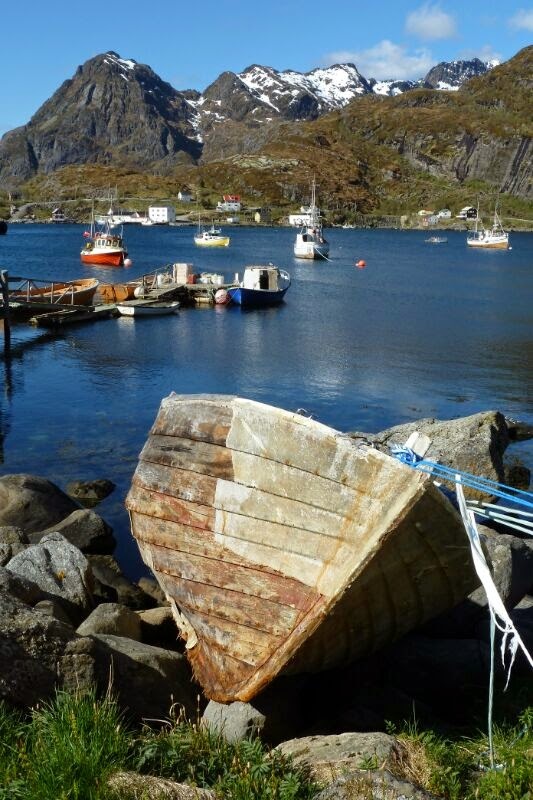 But meantime, I'll leave you with more photos from the lovely Lofoten Islands. Route - followed E6 south then picked up quiet roads where possible. Ferry to Harstad on Vesteralen islands then another ferry to Lofotens. 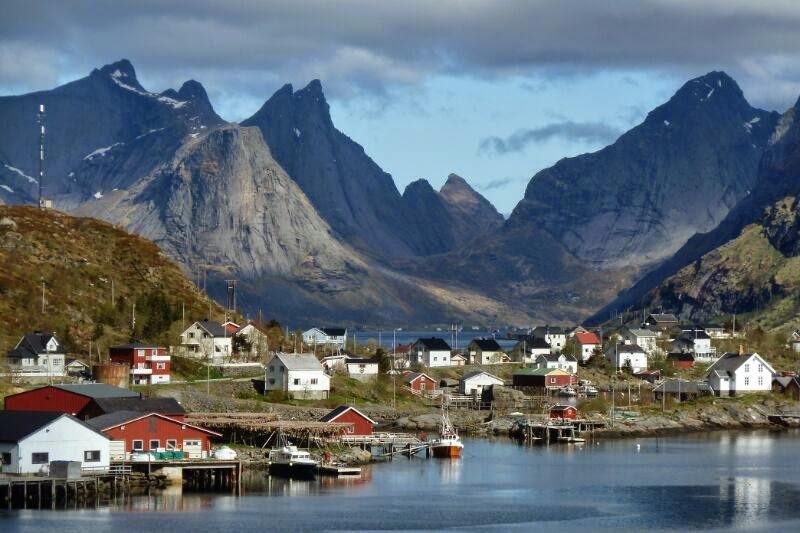 Cycled down its main road to end of the idlands at village of A. Lofotens are beautiful and a great cycle but there is a bit of wind and lots of tunnels, many have cycle bypass routes.